This is an oldie, but a goodie! Just made this again this weekend and was reminded of how wonderful I few simple ingredients can be! Someday, I am going to retire and move to Italy. In my mind, that retirement includes doing yoga on the sunny balcony of an apartment in Cinque Terre, overlooking the Mediterranean Sea. And shopping in the weekly market to buy fresh cheese and produce and local olives, capers, tomatoes and fish. And socializing with the other local old people who gather at the market. That image of coastal Italian splendor often helps me get through challenging days. It’s a nice mental happy place that includes food! This recipe may become the tangible representation of my idyllic dream. With some fresh fish from Locals Seafood, local, organic fennel, fresh local tomatoes and parsley and thyme from our garden, this is a quick, summertime winner. If you want to grill your fish, you could do that and make the sauce in a separate dish–easy! Heat the olive oil in a saute pan over medium heat. Add the fennel and cook without browning until it is soft (about 15 minutes). Season to taste with salt and pepper. Add the thyme and garlic and cook an additional 1 minute. Stir well. Add the chopped tomatoes, olives and capers to the pan. Raise the heat a bit and cook until the mixture is thick, but not dry (about 15 minutes depending on how much liquid your tomatoes hold). Reserve and keep warm. Cook fish to your preference (I pan seared ours, but grilling would be great also). 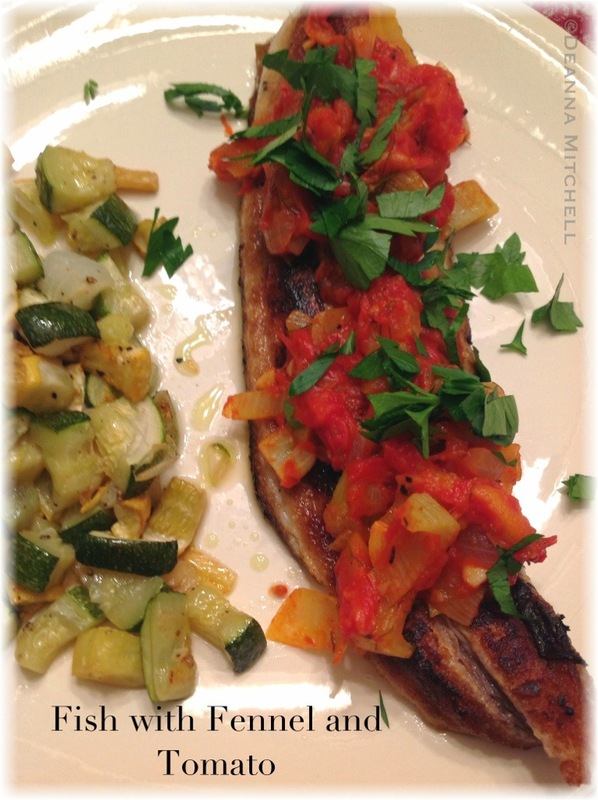 Plate the fish and top with the tomato and fennel sauce. Garnish with parsley.